Allison Carter met with us after her trip to Egypt to share the story of how she fulfilled her dream of participating in a camel ride across the desert. Do you have stories of your summer vacation that you would like to share as well? Post your comments at the bottom of this post. My name is Allison Carter and I was in Egypt for 15 days. I was really psyched about going on a camel ride. They’re just really funny looking, kind of ugly cute. I couldn’t wait to take a ride on a camel and we actually got to do it in an amazing setting; It was a ride up to the Monastery of Saint Simeon. So we get off a boat, we take a motorboat across to the other bank of the Nile and there are all these camels there. I climb on my camel and I have this little camel boy with me to make sure the camel doesn’t kill me. I asked what the camels name is. My camel is named Titanic which he seemed to think was great because the camel was very tall as far as camels go. I didn’t seem to think it was such a great thing. We ride to the top of this hill and there is this monastery from the 12 century; so of course it is pretty new relatively speaking in Egypt. It’s amazing just to be up there and to see the landscape of the Nile beneath you and this ancient monastery. Afterwards I actually got to ride the camel a longer distance across this high plateau to this small Nubian village where we had tea with a local family. It was a really cool Lawrence of Arabia experience. Atlas Travel Insurance is a short-term health insurance plan for international travelers. The plan offers coverage options of up to 1 million dollars and can be purchased online in as little as ten minutes. 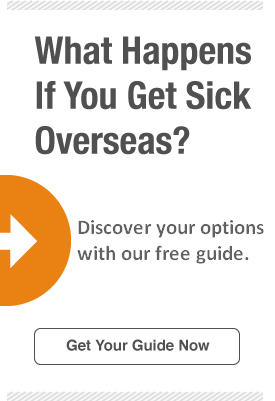 For more information on international medical insurance, visit our travel medical insurance webpage.